Today we have a real corker! 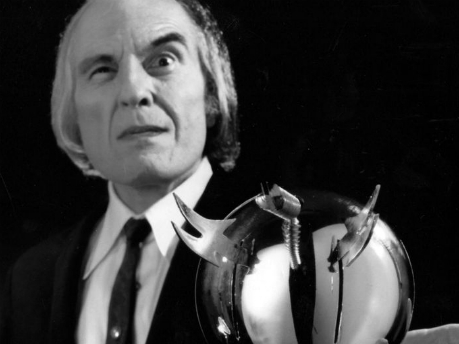 Phantasm is one of those movies that most people have seen the DVD sleeve and thought "man that looks crazy". The basic premise is that a young lad and a suspiciously friendly ice cream man discover that the local funeral home is the source of evil. Enter the Tall Man, played to great effect by Angus Scrimm. The Tall Man is an inter-dimensional traveller who controls an army of zombie dwarfs and a fleet of handy little chrome balls each with enough tools and appliances to put a multi-tool to shame. I won't go on much more other than to say the story stretches across a 4 DVD collection and you really need to see them all to appreciate the gravity of the story.